Can this Photoshop wannabe finally match its expensive rival? 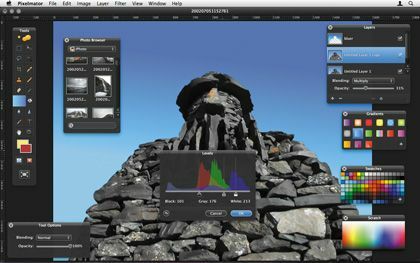 Most consumer oriented image apps concentrate on photography rather than editing. Pixelmator is an attempt to turn the clock back, somewhat aping Photoshop circa 2002, albeit at a fraction of the cost. Back in MacFormat issue 189, we bucked the trend by calling Pixelmator 1.0 "a nice idea, badly implemented" and 'awarded' it one-and-a-half stars. Our concerns were huge performance issues, an irritating interface with loads of semi-transparent components and odd toolset omissions. These problems remain to some extent, but Pixelmator's come on a long way. The interface remains awkward in some areas – palettes are sprinkled around and you can't type values into dialog fields – but transparency is less evident, the action tooltips used throughout are a lovely touch, and the intuitive way in which selections are made (with plenty of visual feedback) beats Photoshop in its current state, let alone seven years ago. The toolset is suitable for creating and editing RGB screen graphics, and the web-slicing and export tools should suffice for amateur web designers. However, the lack of layer effects is a pity, and pros will be hampered by Pixelmator's iffy brush management and poor performance on large images. In tests, Pixelmator slowed noticeably when images were larger than 3,000 pixels per edge, but was snappy for smaller images. Pixelmator is finally worth a look.